(Open Box) Load up with gig-ready power, punchy tone, tilt-back design and great practice features. 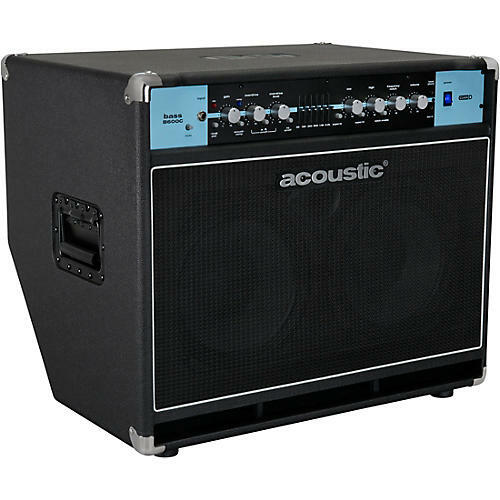 The Acoustic B600C Bass Combo delivers 600 watts of clean Class-D amplification through two custom-voiced 10” ferrite speakers, giving advancing and pro players all the power and tone they need for stage and studio. The B600C offers a versatile cabinet that can be used in a traditional vertical configuration or tilted back, allowing precise personal monitoring at rehearsals and performances. And for optimal sound-sculpting, the B600C features a 6-band graphic EQ, a convenient Shape Switch with a variable Notch Filter to dial in those important mid-tones, and a Blendable Overdrive circuit, giving the player a wide variety of expressive tonal options across a variety of musical genres and styles. Super-Hi and Super-Low EQ Boost switches and the exclusive Acousti-Comp™ switchable compression offer even more overall sound control. Other pro features include a -10dB input pad and Mute switch, as well as an FX Loop for unlimited effects expansion. A full-featured, pre- or post-EQ XLR Direct Out with level control and a ground-lift circuit provides pristine connectivity to front-of-house systems free from annoying and damaging interference. The 1/8” headphone out is ideal for private practice, and its 1/8” Aux In connects external music devices for convenient play-along and practice.